As Israel prepares to celebrate its 64th year, the population stands at almost 8 million – an almost tenfold rise from 806,000 in 1948. 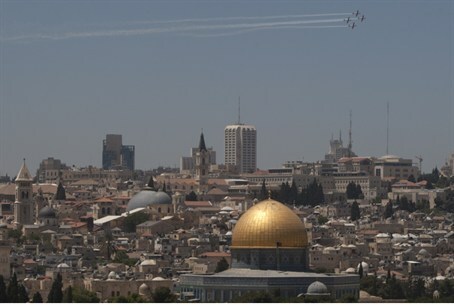 According to Israel's Central Bureau of Statistics the population of Israel numbered 7,881,000 people on the eve of its 64th anniversary. At the time of its declaration on 14 May 1948 (5 Iyar 5708), the day before the British Mandate was due to expire, Israel consisted of only 806,000 residents. David Ben-Gurion, the Executive Head of the World Zionist Organization and the chairman of the Jewish Agency for Palestine, declared "the establishment of a Jewish state in Eretz-Israel, to be known as the State of Israel." New data published by the CBS, indicates that nearly 5,931,000 Israel's population are Jewish – 75.3%. The Arab population stands at 1,623,000 – 20.6% – and the remaining 4.1% are immigrants and their children not listed as Jewish by the Interior Ministry. They comprise 327,000 residents. Since last year's Independence Day, 161,000 babies have been born in Israel, and 39,000 people have died. Approximately 19,000 immigrants arrived in the country, while nearly 8,000 chose to leave Israel. Another 4,500 people joined the general population as a result of family reunifications. In total, Israel's population grew by 137, 500 – a 1.8% increase. The data also suggest that more than 70% of the Jewish population are native-born Israelis, and more than half are at least second generation Israelis. In contrast, only 35% of the current population were native-born in 1948.